Pycnopodia helianthoides (AKA Sunflower Star or Sun Starfish) is a nasty customer. This is the T. Rex of the starfish, and can travel a blistering 40 inches per minute to boot. When you get one of these in a trap, it is imperative to remove them right away, or they will clamp down on whatever it is grabbing onto with up to 24 tube feet-filled arms with such force, it may be unable to extract the animal without ripping off some of the tube feet. They also have pincers on their top side that are used to discourage potential predators. In addition, they can secrete a mild poison when agitated. In the ocean, it acts as a mild deterrent, but if this stuff is contained in a small tank, it could cause more serious damage to fish or other animals in such a constrained environment. Juvenile sunflower stars start life with five arms—by maturity they sport up to 24 arms. Most sea stars have a one-piece, semirigid skeleton. 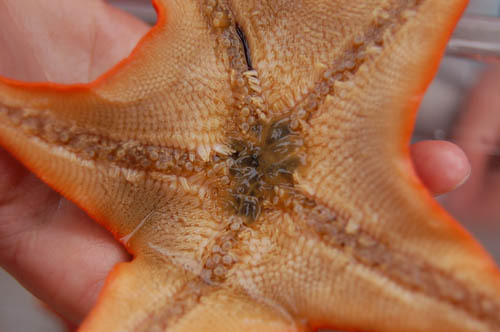 However, the sunflower star’s skeleton has a few disconnected pieces. They allow the sunstar’s mouth to open wide and its body to enlarge and take in big prey. A sunflower star can swallow an entire sea urchin, digest it internally and then expel the urchin’s test—its external shell. In Monterey Bay, the sunflower star eats—in season—dead or dying squid. After the star digests the squid, the indigestible squid pen—its internal shell, which is too large to be defecated—works its way through the body wall. I know of nothing that likes to eat Pycnopodia helianthoides, and I can see why. Besides the toxins, pincers, and enormous size (they grow over a meter long from tip to tip), they are covered in a viscous slime, much resembling a suit made of snot (it has the texture of grated yama imo). It might be worth handling, just to give someone a hearty handshake immediately afterwards. I can just picture the look of horror on the hand of the recipient as they quickly withdraw from the shake, with tendrils of mucus stretching and extending like strings of natto linking the tips of a pair of chopsticks to a bed of freshly stirred fermented soy beans. Mmmmmm… Natto. This picture was taken yesterday with the D-50. The moon still looks really full on this shot from today, taken on my DMC-TZ3. Shark Attack near my apartment! My sister wanted to bring a surfboard up from Orange County so she could learn how to surf, but she has changed her mind. *BONUS* – MBA has a new white shark on exhibit. Only 4 feet and change, it kind of looks like a puppy, swimming around the Outer Bay Exhibit with the bubble curtain up. The Yellowtails are the coolest fish in the Kelp Forest Exhibit. Not only are they my favorite sashimi fish and great fighting on the rod, but they’re also fun to watch under water. They cruise around like a pack of attack submarines, and the bait fish try to keep as far away from them as possible. Oftentimes, the other fish will use this to their advantage and snag an Anchovy that’s broken formation with the rest of the school and preoccupied with watching the Yellowtail. Many a Rockfish has gotten its lunch in said fashion, thanks to the Yellowtail. On this day, one of the ‘tails was chasing a Leopard Shark, that was three times it’s size, around the exhibit. It kept on rubbing against the shark, and despite trying its hardest, the shark was unable to run away. I wonder if it was using the shark as a back scratcher, to dislodge parasites, or asserting its dominance as king of the exhibit. Maybe it was a bit of both. The most popular fish in the aquarium? From this distance, it is hard to make out. It was about the size of a small garbage can lid. A naturalist once saw something very similar to this in the kelp forest and got very excited. “White Shark!” was the call heard on the radio, but alas, it was not a White Shark. So what was it? It was a Mola mola, the awkward Ocean Sunfish, a ferocious predator of jellies, larval animals floating around as plankton, and perhaps seaweed and eel grass. For some reason, my camera has been drawn towards this largest of bony fishes in different places. I am not the only one who likes the mola- I think it’s the most popular fish in the aquarium. The big mola in the Outer Bay Exhibit, the one that weighs over 1000 pounds, has been given so many names by little children and smitten adults alike. If you were to tally the names, “big fish” would likely be the most common, followed by “ugly fish”. I like to call it “Bob”. A bee pollinates a California poppy, which also happens to be our state flower. Its bright orange is much like that of the Garibaldi, California’s state fish. A few months ago, Pacific Grove installed these tsunami warning signs along the coastline. I swear I’ve seen a design very similar to this in Japan somewhere. This barnacle shell has been taken over by seaweed. The shell broke off, the seaweed dried out, and now it is resting on the beach at Lover’s Point. With this smaller camera, I can be more discrete when taking pictures, I can take it places where the D-50 is impractical, and I can use it to shoot in ways that the D-50 can’t. With this new camera I’ll be able to shoot using a display, which should be interesting. I find that the style of my photos is a bit different when I use a viewfinder, as opposed to looking at a screen to compose a picture. It feels good to have more than just an SLR again. I wish every day could be New Camera Day! A tiny sea urchin rests between closed fingers. This is a shot of a polychaete worm and the same urchin. The blurs in the background are (rotating clockwise from the upper top) a shrimp, an isopod, a melibe, a limpet, and some other creatures. In the foreground, there are the urchin, polychaete worm, and a couple of juvinile Kellet’s whelks that are either being amorous or quarrelsome. Their proboscises were extended as they wrestled together in what must have seemed to be the macro-marine equivalent of the Colosseum. No, they did not fight to the death, but if they did my money would be on the worm. I recall that Justin and I used to use polychaetes as bait when we went fishing in Awajishima for kawahagi and other strange, exotic fish. The kelp crabs and decorator crabs are really good at hiding, and are not very eager to be photographed. It’s amazing the variety of colors that they display, from lemon yellow to grass green to brick red. Peace and quiet have once again departed from the harbor, with the return of the California Sea Lions. Adding to the cacophony, the Sea Otters have been shrieking like banshees lately. To top it off, the gulls consistently wake me up in the morning with their vocalizations, and follow me to work with their squabbles. There is something to be said for peace and quiet, especially in the morning when you are trying to sleep. Sometimes, when the gulls are particularly loud and persistent, I come up with some interesting ideas. For example, I may develop an urge to hold onto the extreme annoyance that is conjured up by the squawking birds, and use it to wake up the gulls when they are trying to sleep. It is only after I am fully awake that I realize how stupid it would be to actually act on the ideas that pop into my head when I’m irritated in this too-early-in-the-morning state. The Derek M. Baylis is designed to be a research vessel, and a lot of thought went into its design to maximize workspace and to make it a model for all other research and educational vessels. 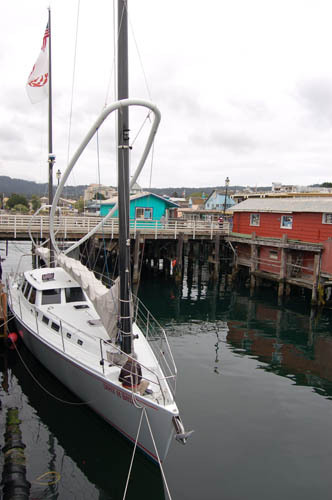 Among some of the notable features, the Baylis sports a wishbone boom (click here to read more about how the sailing mechanics work using a wishbone boom) and a motor that runs on a bio-diesel blend that “sips” gas. What is a wishbone boom and how is it different from a conventional one? The best explanation that I’ve heard is that a conventional boom is to a wishbone boom as a stick shift is to an automatic. The rig self-regulates the shape of the sail since it is suspended and not fixed to one point on the mast. Monterey Bay Aquarium and Sealife Conservation run educational and leisure cruises in a joint venture. The aquarium provides the naturalists (of whom I am one) and sells tickets, while Sealife Conservation provides the crew and the boat. I usually start my day below the docks, picking up the clipboard that holds the ship’s manifest. As you can tell, all of the male California sea lions are coming back from their summer down south in the Channel Islands, where they were busy mating. It’s amazing how quickly they’ve returned, and how valuable real estate has become around the harbor. Over 90 percent of the sea lions up here are males. The females prefer the warmer waters down south. As one visitor put it, Monterey Harbor sounds like a big frat house because of all of the noise and displays of dominance among the male sea lions. 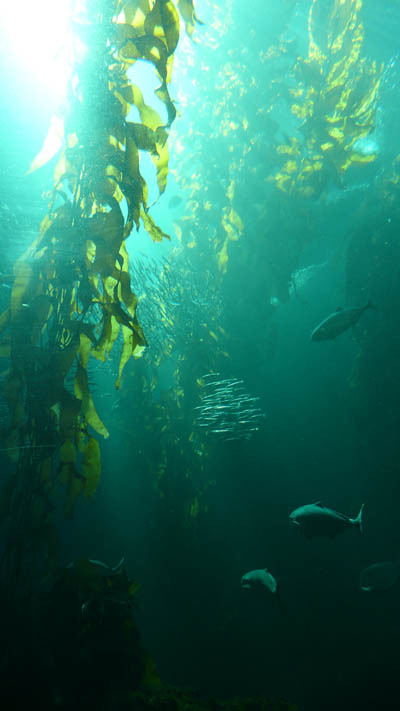 Giant kelp is the foundation of the ecosystem along the California coastline. It serves as a nursery, a food source, a place to hide, or a place to hold on to for countless organisms. On a piece of drift kelp that we pulled up today, we found polychaete worms, kellet’s whelks, bryzoans, melibes, small shrimp, isopods, amphipods, a baby sea urchin, fish fry, decorator crabs, and kelp crabs. This was a spectacular haul and a great illustration that kelp is some really cool stuff. Kelp crabs are good at letting you know that they don’t want anything to do with you. Their pincers are sharp like needles, and painful if they catch your fingers. They make searching through kelp interesting for those willing to paw through the slimy kelp. Anyone for paralytic shellfish poisoning? That’s what you might get if you drank from the codpiece of our plankton net this afternoon (By the way, codpiece refers to the portion of the net where the plankton is concentrated, as the design was taken from a cod fishing nets and that’s where the cods ended up. It is not, as I originally though, named after ye Medieval jockstrap.). The plankton that we’ve been pulling up have mostly turned the net a brownish green, but today it was red with dinoflagellates. Besides causing the red tide when they bloom, they are also responsible for phosphorescense. During WWII, the GIs in the Pacific learned that Japanese snipers used to target those using flashlights at night. At night time, some soldiers used their cotton shirts to sieve dinoflagellates out of the water, and allowed them to dry into a powder. By taking a pinch of the dehydrated dinoflagellates, they were able to read their maps with the faint blue light produced by smashing it between their fingers and avoid the snipers, who were looking for the yellow light produced by the flashlights. In addition, phytoplankton produces an over 60 percent of the Earth’s oxygen and is the basis of the food web in the ocean. It sequesters CO2 as CaCO3 (chalk), and layers of fossilized plankton give us SiO2 rich deposits as well, which we use to filter out our swimming pools (salacious earth). Plankton is some pretty cool stuff. If you drop a crab trap, or “benthic sampler” (there are many designs, my favorite being a clamshell design that traps mud from the sea floor), down to the bottom of the outer edge of the kelp forest, most of what you pull up is likely to be batstars. This one has it’s stomach out. You may recall that starfish eat by bringing their digestive system to their food. They hug whatever they are eating with their stomach, in other words. The orange ones range down to Mexico and the purple ones up to Alaska, and they meet in Monterey. They often host symbiotic polychaete worms which clean the batstars of food scraps and parasites. Predators of batstars include, but are not necessarily limited to sea gulls, sea otters, and other larger species of starfish. They can easily regenerate an arm if they happen to lose one. Batstars are echinoderms, related to things like sand dollars, sea urchins, and sea cucumbers. If you look at echinoderms, they all have a pattern of five points radiating from the center. Some batstars have up to seven arms, and at each tip of each arm is a primitive eyespot, with which they can sense the presence or absence of light. When the sails are raised, the boat starts to really show off how well it handles. We routinely hit 10 knots with a reefed main sail, without the help of the mizzen (the smaller sail in the back of the boat). Since the boom is so high, the foredeck is a pretty safe and comfortable place to enjoy the cruise. When it’s time to put away the sail, the halyard is released and the sail quickly drops into the hammock below in a matter of seconds. 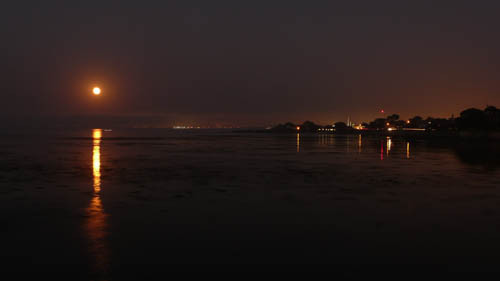 This is a shot of Monterey Bay Aquarium in the foreground, looking down the length of Cannery Row. We stick to this area in the bay, as it provides a relatively sheltered patch of water, and a great view of the coastline. In this patch of coastline I’ve seen Humpbacks, Grey whales, Common Dolphins, Risso’s Dolphins, Pacific White-sided Dolphins, Harbor Porpoises, California Sea Lions, Southern Sea Otters, and Harbor Seals. 200 years ago, there were grizzly bears feasting on whale carcases, and 300 years ago there used to be a giant sea cow, the Steller’s sea cow, that munched on the giant kelp. After the sea otters were almost hunted to extinction, there were long periods of time where the kelp disappeared from the coastline. Only after otters started to re-populate the coast did the kelp forests return and stabilize. By telling these stories, making ecological connections, and facilitating discussions, we are able to really educate and inspire those who come along for a ride on the Baylis. Some of the most accessible public canvasses in the world reside under one bridge or another, even in Monterey. Unfortunately, graffiti in the US is dominated by taggers who lack skill and so desperately feel the need to be noticed. Will the wild popularity of manga and anime in the States result in a shift from tagging to creating more legitimate works of public art? Hopefully, the answer will be yes.